I don’t know if submitting two mirrors was acceptable but if not then the powers-that-be can choose one to use for the challenge. I just wanted to show it off a bit. I made this mirror as part of a bathroom renovation I completed this winter. The mirror is framed in Maple. The lights are scroll cut with electrical wires for them embedded in the wood and passing from an electrical box behind the mirror and out to the lights. I bought some bathroom lights from Lowes and cannibalized the socket and cylindrical globes. The globes are mounted in bowl shaped units I made with a slot routed in them to accept the circular glass. The whole unit is screwed at the edges tot a piece of hardboard mounted on the wall. The location of the mirror in the before picture is where the shiny spot from the flash is on the wall. 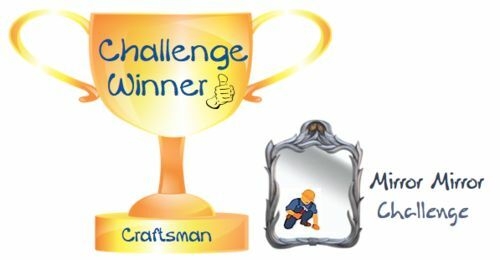 Craftsman this mirror is looking very nice. Maple is a nice wood to work with. The lights absolutely beautiful. Very nice. The angle pic makes the scroll work appear to wrap around the base of the light. Nice detail. Congrats, you are the winner and you deserve it! I really like you Mirror creation a lot.